Toéssin is a village around 8 km from Ouahigouya, the capital of Burkina’s Northern Region. Ever since the HER CHOICE programme was launched in Burkina Faso, the community of Toéssin has benefitted from a lot of awareness raising activities aiming at ending child marriage: movie screenings, conferences, group discussions and other awareness raising activities were organised in the schools and the wider village. Several teachers have been trained as sexual and reproductive health and rights (SRHR) experts who now transmit the right knowledge and refer young people to health services. 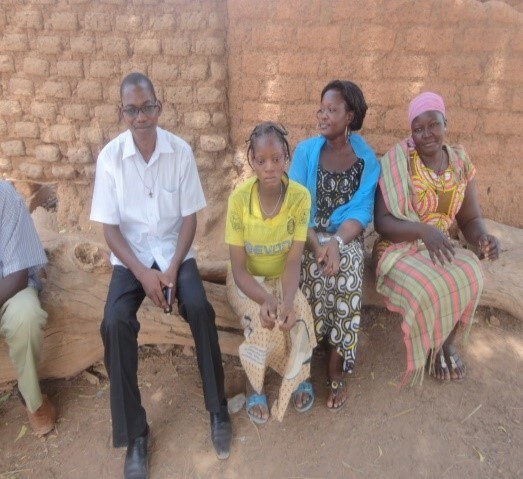 One day, in 2016, one of these teachers contacted the HER CHOICE local partner Association des Julaphones du Burkina Faso (AJBF) about an extreme case of teenage pregnancy. 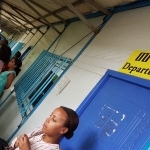 Fatoumata Ouédraogo, a twelve-year-old student in Toéssin village had become pregnant. The supposed father of the child was a seventeen-year-old boy also living in the village. This boy had never attended school, and worked on the land. He wanted Fatoumata to become his wife and suggested that she went to live with him. When Fatoumata’s parents discovered that their daughter was pregnant, they got very upset. In front of her school friends, they humiliated her. Fatoumata was ashamed. She didn’t want to go to school any more. She would rather choose to join the father of her child and abandon education. The teacher who warned AJBF took action again and thanks to this, AJBF was able to act quickly: the project team visited Fatoumata´s home. Following local customs, they first talked to the parents (in the picture below, together with their daughter). They were surprised to see to what big extent these people, themselves farmers and uneducated, were convinced of the importance of schooling for their girl. Fatoumata’s mother herself had always regretted not having had the chance to go to school. After a thorough discussion with the parents the team went on and talked with Fatoumata. She didn´t want to give up her decision to get married as she felt having lost face in front of her school peers and teachers. 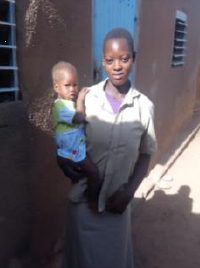 However, in those areas it is not uncommon for a pregnant girl to attend school. Thanks to AJBF’s sensitisation efforts and negotiations, the problem was sorted out: Fatoumata accepted to go back to school, and her parents accepted to support her during the pregnancy and, later on, to take care of their future grandchild so that Fatoumata could finish her education. Teachers also gave her great support and she improved her grades, which made her very happy and renewed her self-confidence. Unfortunately after a few months, Fatoumata (in the picture on the right, few days after giving birth) struggled with health problems – unfortunately not uncommon for pregnant young girls. Her parents, despite their willingness to overcome cultural barriers, are poor and couldn´t pay for her medical bills. AJBF jumped in again and supported the family. Thanks to the collaboration with the health centres, Fatoumata received the help she needed – until after the delivery of her child. 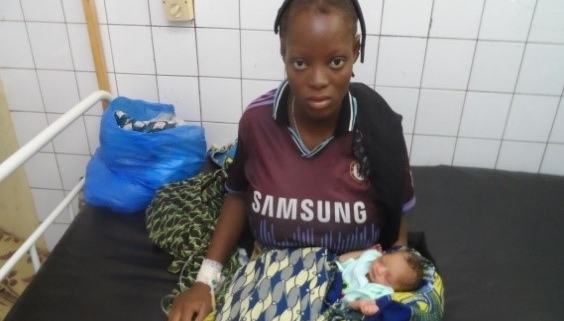 As a consequence of the early pregnancy and poverty, she gave birth to a premature girl who weighed 1.72 kg and suffered of anaemia. 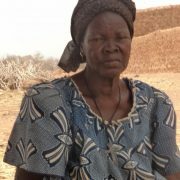 Comprehensive and multidimensional support has being given by HER CHOICE to Fatoumata and her child ever since. Few weeks ago, a HER CHOICE cooordinator working for Stichting Kinderpostzegels, had the chance to interview Fatoumata (picture on the left, as she is nowadays) and check how she is doing after this year and half. 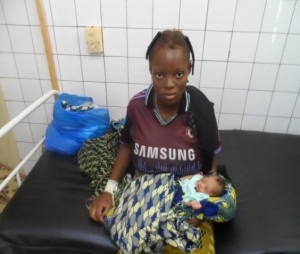 “I am very lucky to be still alive“- Fatoumata says. “If you become a young mother that way, your life will change completely. You get too much responsibilities at a young age. Fortunately, my family gives me a lot of support. My mother takes care of my daughter when I go to school. I have since used my history to help other young people to take their responsibility and become aware of their reproductive health and rights, which is the core of our well-being“.